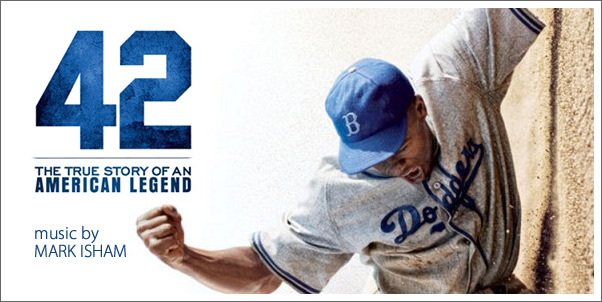 42 is the re-telling of the true story of Jackie Robinson, an African-American baseball player who became a sporting hero despite having to endure unrelenting racism on and off the field. The film mainly focuses on the 1947 Brooklyn Dodgers season and stars Chadwick Boseman as Jackie and Harrison Ford as Branch Rickey. Legendary composer MARK ISHAM was brought on board to score the music for the film. Isham, now in his 4th decade of film composition is famous for many great scores such as POINT BREAK (1991), A RIVER RUNS THROUGH IT (1992), BLADE (1996), THE BLACK DAHLIA (2006) and the Oscar nominated CRASH (2006).